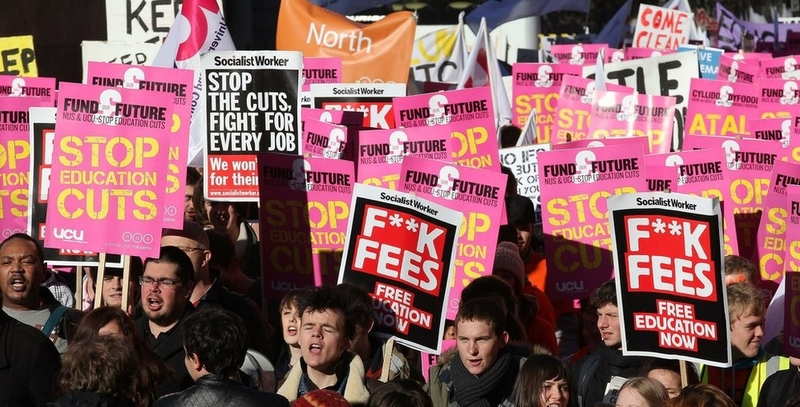 A rise in student tuition fees that reached up to �9,000 caused a massive student demonstration in London. After the majority of the students marched and dispersed a smaller group remained and violence kicked in. John Denham said the students had a legitimate cause and needed to be listened to. According to an article published at the BBC student protests in London "did not go to plan" but the blame lay on those who were violent, Nick Herbert has said. Aerial images showed this small group going at it. Windows, small fires, violence and clashing. Police surrounded them. I was covering violence and demonstrations in other parts of the world when I was surprised to see this kind of violence happening in the streets of London. News reported that The National Union of Students said about 50,000 people joined the demonstration, but according to Scotland Yard only 225 officers were initially drafted in. Shadow business secretary John Denham said the students had a legitimate cause and needed to be listened to. "Those parents and the students who were there yesterday have a legitimate cause that needs to be taken up and debated. We mustn't allow the despicable action of some protesters to divert attention from a real issue." John Denham said. Voices of some spokesman on TV said �These are the new generations, the people who will lead the country in the future�. Another voice explained that the majority of students had dispersed and this was just a small group. Then another voice at CNN said, "today there is so much noise in London that is impossible for anything else to be heard".